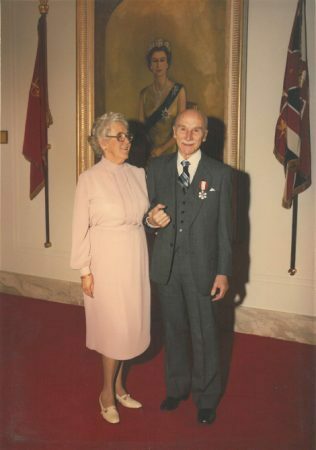 Dr. Ben Gullison, shown when he received the Order of Canada in 1980 for his many achievements. The Canadian who inspired the founding of Operation Eyesight, Dr. Ben Gullison, passed away in 1987. It is his vision of “the best for the poorest” that we still strive to achieve. Dr. Ben had a deep connection with India, having spent 10 years there as a child with his missionary parents. He returned to India with his wife Evlyn as part of the Canadian Baptist Mission and arrived in the town of Sompeta in 1935, a time when there were no roads or electricity and the hospital was a one-room, thatched-roof hut. The Gullisons channeled their energy into helping build a new facility, later named Arogyavaram Hospital. As the years went on, Dr. Gullison became increasingly concerned with the number of destitute blind he encountered. Eyes were not his speciality, so he invited ophthalmologist Dr. John Coapullai to join the staff at Arogyavaram. The two later estimated that 200,000 curable blind people lived within 320 kilometres of the hospital. Thanks to funding from an American charity, they began offering free cataract surgeries. Then disaster struck. After two years, the charity ended their funding. And so, in 1962 the Gullisons returned to Canada to seek support for their hospital. In Calgary, Dr. Gullison met Art Jenkyns, who helped create “The Dr. Ben Gullison Club” to raise money. The humble Dr. Gullison disliked the name, but he couldn’t argue with the group’s success; they raised enough money for 148 cataract surgeries that year. At Dr. Gullison’s request, the group renamed itself “Operation Eyesight,” and by 1970 was raising enough money to take over total financial responsibility for Arogyavaram Eye Hospital, which had become a dedicated eye facility. Operation Eyesight is the shared legacy of Art Jenkyns, our founder, and Ben Gullison, our inspiration. We are still pressing forward and reaching out towards Dr. Gullison’s vision of a world without avoidable blindness.